1515 Hermann Drive | Houston, TX 77004 2017 © All rights reserved. Kevin P. Lally, MD, MS, chair of the Department of Pediatric Surgery, is the recipient of the 2017 Coe Medal from the Pacific Association of Pediatric Surgeons (PAPS). Click here to read the article published in SCOOP, A Publication of McGovern Medical School. Dr. Lillian Kao, Dr. Michelle McNutt, Dr. Bryan Cotton and Dr. Saleem Khan, from left, are shown with their awards during the 2016 Acute Care Surgery Division Faculty Appreciation Luncheon May 23 in the 5th Floor Gallery of McGovern Medical School. Kao won the Mentorship Award, McNutt won the Professionalism Award, Cotton won the M&M Award and Khan won the inaugural "Khan Award." This article was originally published on the McGovern Medical School website. If you were acting up on the streets of Amarillo several years ago, Blake Henchcliffe, M.B.A., a second-year McGovern Medical School student, was the last person you would want to see. Before deciding on a career in health care, Henchcliffe, 34, spent seven years maintaining law and order in the heart of the Texas Panhandle as an officer in the Amarillo Police Department. Halfway toward earning the right to put an M.D., behind his name, Henchcliffe was honored earlier this month at the 2016 Academic Surgical Congress in Jacksonville, Fla., for a research project to reduce complications associated with hernia surgery. He received a 2016 Student Research Award from the Association for Academic Surgery. To find out why some surgery patients have difficulty losing weight or reducing other risk factors for complications, Henchcliffe surveyed 43 patients at Harris Health System’s Lyndon B. Johnson Hospital. In particular, Henchcliffe wanted to determine why only five of the 24 patients who were eligible for a preoperative risk-reduction plan chose to participate. Their reasons, according to Henchcliffe, included not being able to get to the program or having someone to watch their children. Others could not afford to take the time off work. With the survey results in hand, risk-reduction program officials were able to improve participation by providing transportation or parking vouchers among other things, he said. Henchliffe’s collaborators from the Department of Surgery were Julie Holihan, M.D. ; Juan R. Flores-Gonzalez, M.D. ; Thomas O. Mitchell; Tien C. Ko, M.D. ; Lillian S. Kao, M.D., M.S. ; and Mike K. Liang, M.D. Ko is a Jack H. Mayfield, M.D. Distinguished Professor in Surgery at UTHealth. Their research letter was titled “Barriers to Participation in Preoperative Risk-Reduction Programs Prior to Ventral Hernia Repair: An Assessment of Underserved Patients at a Safety-Net Hospital” and was supported by the Center for Clinical and Translational Sciences at UTHealth, which is operated in conjunction with The University of Texas MD Anderson Cancer Center and Memorial Hermann Health System. With all this time spent on surgery research, does this mean Henchcliffe plans to be a surgeon? “I’m thinking about it but I still have a way to go,” he replied. This article was originally published on the UTHealth Medical School website. This article was originally published on the TMC News. For more information on Dr. Coselli’s success, please visit the TMC website for more information. Kevin P. Lally, M.D., A.G. McNeese Chair in Pediatric Surgery, Richard Andrassy Distinguished Professor and Chairman of the Department of Pediatric Surgery at The University of Texas Health Science Center at Houston (UTHealth) Medical School is being recognized by the Houston Surgical Society as the Distinguished Houston Surgeon for 2014. Annually, the Houston Surgical Society nominates and honors a fellow surgeon for their contributions to the surgical profession. Lally is on the Board of Governors for the American Pediatric Surgical Association and the Past Chair of the Surgical Section of the American Academy of Pediatrics. He is internationally known for his work of diaphragmatic hernia and extracorporeal membrane oxygenation. This article was originally published on the TMC News. For more information on Dr. Lally’s success, please visit the TMC website for more information. Four Medical School faculty members have received The University of Texas System Regents’ Outstanding Teaching Award, which recognizes those who deliver the highest quality of instruction in the classroom, the laboratory, the field or online. A total of nine faculty members from UTHealth were selected for this honor. Faculty members were assessed on criteria including classroom expertise, curricula quality, innovative course development and student learning outcomes. A total of 39 new members from UT health institutions were elected this year. Dr. Lillian Kao, a professor in the Department of Surgery, focuses her research on improving disparities of care. She was recently president of the Association for Academic Surgery, which promotes the development of young academic surgeons through courses on surgical research and career development, research awards, and early opportunities for leadership. Kao sees patients at Memorial Hermann-Texas Medical Center and Harris Health’s Lyndon B. Johnson Hospital. This article was originally published on the UTHealth Medical School website. For more information on Dr. Kao’s’ success, please visit the UTH website for more information. Hearts of Gold Gala honors women making significant strides in health and medical science, and recognizes their contribution through patient care and safety, research, teaching, leadership, publication, and community service. The evening includes an elegant dinner followed by guest speakers, a video highlighting women in medicine, and ends with recognition of our honorees. 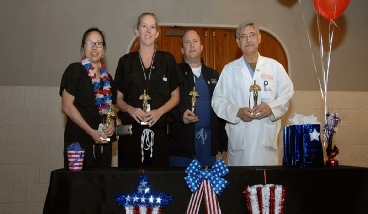 The Houston Surgical Society recognizes three (3) member physicians - Drs. Bass, Brandt & Perrier - who will be honored at the Hearts of Gold Gala, Friday, September 19 at Hotel Zaza. Please see honoree below. For more information do visit, The Health Museum website. Dr. Bass has led a funded laboratory program in gastrointestinal epithelial injury and repair and has held leadership roles in the development of surgical quality initiatives at the national level in both the Veteran Affairs Health Care System and at the American College of Surgeons. Most recently, Dr. Bass was appointed to the Strategic Planning Group of the National Institutes of Health’s National Commission on Digestive Diseases. Dr. Brandt's research seeks to improve outcomes for all children who require surgery by designing prospective clinical trials in pediatric surgery. She is Director of the William J. Pokorny Fellowship and mentors residents and students in the design and implementation of pediatric surgical clinical studies. Dr. Brandt is also the Principal Investigator for an NIH study designed to research the outcome of bariatric surgery in adolescents. Dr. Perrier has served in numerous roles in MD Anderson’s Department of Surgical Oncology including, Chief-Section of Surgical Endocrinology, Associate Medical Director, and Fellowship Program Director. A. Osama Gaber, M.D., FACS, Director of the Houston Methodist J.C. Walter Transplant Center, sat down with Texas Medical Center Chief Strategy and Operating Officer and Executive Vice President William F. McKeon to talk about his vision for a community Center for transplant recipients, and the mission of the foundation he started in his daughter’s memory. This article was originally published on the TMC Pulse. For more information on Dr. Gaber’s’ success, please visit the TMC Pulse website for more information. Hazim Safi, M.D., chairman of the Department of Cardiothoracic and Vascular Surgery at The University of Texas Medical School at Houston, has been named president-elect of the Texas Surgical Society. Elected by his peers at the society’s fall meeting, Safi will officially become the organization’s 97th president at its spring 2015 meeting in Galveston. He also is chief of cardiothoracic and vascular surgery at Memorial Hermann Heart & Vascular Institute-Texas Medical Center. Kenneth Mattox, M.D., professor of surgery at Baylor College of Medicine and chief of staff at Harris Health System’s Ben Taub General Hospital, has been elected second vice president-elect by the American College of Surgeons. He will serve in this role for one year and will officially be named second vice president in Oct. 2014. Mattox also received the 2013 Benjamin Rush Award for Citizenship and Community Service from the American Medical Association. The award is given to individuals who have contributed to the community above and beyond the call of duty as a practicing physician, Its namesake, Rush, was a physician and founding father of the United Sates. Barbara Bass, M.D., chair of the surgery department at Houston Methodist Hospital, is the 2013 recipient of the American College of Surgeons’ Distinguished Service Award – one of the highest honors a surgeon can receive. Bass was awarded for her outstanding clinical and academic contributions to the field of general surgery, for her commitment to teaching future surgeons, and for her more than 20 years of service to the American College of Surgeons. In addition to chairing Houston Methodist’s surgery department, she also is executive director of the Methodist Institute for Technology, Innovation and Education, or MITIE. These articles were originally published on the Texas Medical Center News. For more information on these and other physicians, please visit the TMC News website for more information.